Florida's rainy season is in full force and pet owners are being cautioned to keep an eye out for toxic toads that can potentially kill dogs and cats. "The wet season means increased activity of all amphibians," said Maureen Donnelly, associate dean of the College of Arts & Sciences and professor of biological sciences. "Cane toads are exotic pests that thrive in disturbed environments including river floodplains, tree fall gaps, urban environments and other environments disturbed by humans." Cane toads—Rhinella (Bufo) marina by their scientific name—are the largest of the frogs and toads found in Florida, ranging from 4 to 6 inches in length and often weighing more than two pounds. Also known as the giant toad, marine toad or bufo (the Latin word for toad), cane toads are an invasive species introduced to Florida in the 1950s to control pests in sugar cane plantations. Today, they are well-established in the state, from the Florida Keys to north of Tampa and they are gradually extending further northward. As a defense mechanism when threatened, or even at the onset of your pet's playful lick or curious sniff, the toad secretes a milky-white fluid that contains bufotoxin from glands at the back of its head, behind its eyes. Bufotoxin is not specific to the cane toad. It is present in the glands, skin and venom of many toads, other amphibians in the same family, and some plants and mushrooms. "The effects of bufotoxin are dose-dependent," Donnelly said. "Depending on how much is secreted and the overall health and weight of your pet, it could result in serious illness or death to your dog or cat if ingested." Donnelly, a herpetologist who has been studying amphibians and reptiles for 34 years, advises Floridians to not handle or attempt to dispose of the invasive species found in their yards. Native to South and Central America, cane toads are prolific breeders. They are skilled at locating all types of food, including small rodents, reptiles, other amphibians, birds, invertebrates, plants, household waste and pet food. "Cane toads thrive because people feed their pets outside," Donnelly said. "Simply put, don't feed your pets outside and don't leave their food and water bowls outside, especially overnight." 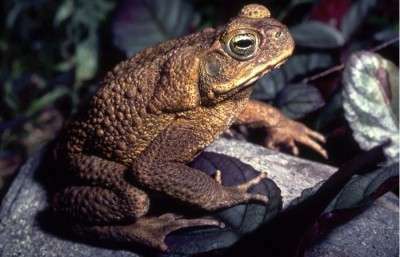 Like all amphibians, cane toads are most active at night because temperatures are low and humidity is high. Because most pet-cane toad interactions are most likely to occur at night, it is important for you to know where your nearest 24-hour animal clinic is located. If you suspect your dog or cat has come into contact with a toad, immediately wash its face, mouth and body with fresh water and take the animal to the nearest veterinarian.